Welcome back for Day 2 of Knitting and Crochet Blog Week! Today is photography challenge day. I decided to let my inner science nerd and inner knitting nerd meet today and I superimposed one of my favorite things to knit (cork people) onto a picture of the lab I work in. 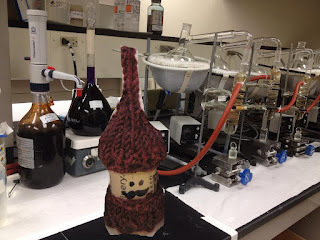 Looks like little cork man is all ready to test some raw sewage for ammonia content.